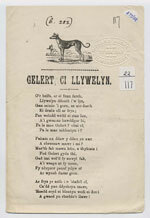 An unique collection of over two thousand eighteenth and nineteenth century Welsh ballads. A number of these ballads originated from the collection of Myrddin Fardd. The “cerdd” in Wales carried out the function of the modern newspaper for a whole century. As such, it is an invaluable tool for researchers looking into the social history of the time. Due to the fragile condition of this collection, Cerddi Bangor are available for consultation on microfilm only.